The H+ Summit is underway here at Harvard. Perhaps appropriately given the venue, this conference has a more collegiate feel than the Singularity Summit I liveblogged last October in New York, at least so far. SingSum had a more formal feel; it was delivered at the 92Y theater in New York, in a large, concert-style hall, and there seemed to be something of an effort to make the whole proceedings feel Important. The presentations here are being delivered in a large college lecture room, and the presenters are interacting with the audience as if they're delivering course lectures. There's also been a lot of chatting about internal business of the H+ organization. This summit feels more like the regular meeting of a large club that's invited in some outside speakers and non-members. SingSum was clearly trying to be Visionary, whereas here they've picked a theme, and sort of a random and low-level one — "The Rise of the Citizen Scientist" — that only a handful of speakers are actually going to be directly addressing. There's a dizzyingly long lineup — the conference is segmented into ten-minute slots, and it's set up to be a series of rapid-fire talks. To make their points, some of the presenters have sounded like the speed-talkers from 1980s commercials. The organizers seem to be rigorously keeping track of the time (despite starting about fifteen minutes late — that's a slot and a half, mind you), and apparently are only taking audience questions via Twitter, I guess just to avoid seeming behind the times. 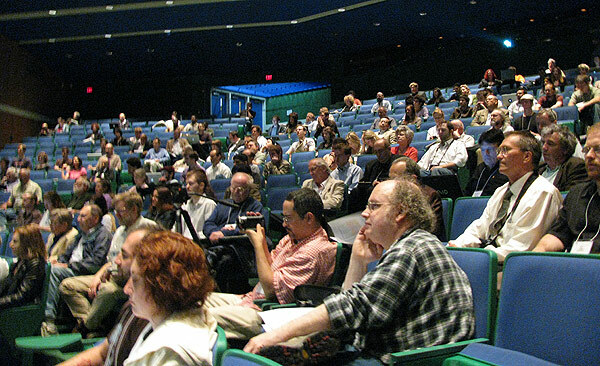 There's always a strange split at these sorts of conferences between big-picture visionary, scientific, and philosophical talks, and presentations on specific but low-level scientific findings that you'd expect to find at a more focused technical conference. The latter seem designed both to fill space and to give the attendees a sense that they are involved in an organized scientific project, and that they're in touch with what's going on. Given the dizzying pace, I'll probably be focusing on the more big-picture talks. Stay tuned. I was sitting right behind you the entire time... wow, interesting.